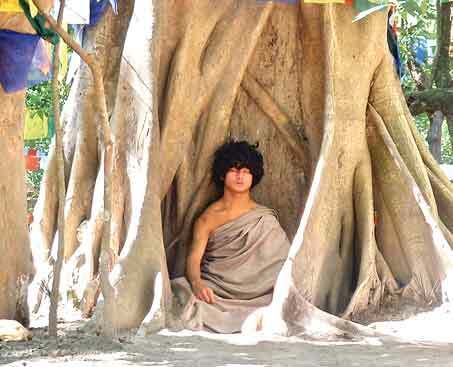 The Buddha Boy of Nepal would end his six years of meditation 2012. He is believed to be the incarnation of Lord Buddha. The mother of Buddha Boy is Maya which is the same name as Princess Maya (mother of Gautama Buddha). He said, "Tell the people not to call me a Buddha. I don't have the Buddha's energy. I am at the level of a rimpoche (teacher & adept). He drew thousands of visitors and media attention by spending months in meditation without food or water. "Murder, violence, greed, anger and temptation have made the human world a desperate place. A terrible storm has descended upon the human world, and this is carrying the world towards destruction. There is only one way to save the world and that is through "dharma" (spiritual practice). When one doesn't walk the righteous path of spiritual practice, this desperate world will surely be destroyed. Therefore, follow the path of spirituality and spread this message to your fellows. Never put obstacles, anger and disbelief in the way of my meditation's mission. I am only showing you the way; you must seek it on your own. What I will be, what I will do, the coming days will reveal. Human salvation, the salvation of all living beings, and peace in the world are my goal and my path. "Namo Buddha sangaya, Namo Buddha sangaya, namo sangaya." I am contemplating on the release of this chaotic world from the ocean of emotion, on our detachment from anger and temptation, without straying from the path for even a moment, I am renouncing my own attachment to my life and my home forever, I am working to save all living beings. But in this undisciplined world, my life's practice is reduced to mere entertainment. The practice and devotion of many Buddhas is directed at the world's betterment and happiness. It is essential but very difficult to understand that practice and devotion. But though it is easy to lead this ignorant existence, human beings don't understand that one day we must leave this uncertain world and go with the Lord of Death. Our long attachments with friends and family will dissolve into nothingness. We have to leave behind the wealth and property we have accumulated. What's the use of my happiness, when those who have loved me from the beginning, my mother, father, brothers, relatives are all unhappy. Therefore, to rescue all sentient beings, I have to be Buddha-mind, and emerge from my underground cave to do "vajra" meditation. To do this I have to realize the right path and knowledge, so do not disturb my practice. My practice detaches me from my body, my soul and this existence. In this situation there will be 72 goddess Kalis. Different gods will be present, along with the sounds of thunder and of "tangur", and all the celestial gods and goddesses will be doing "puja" (worship). So until I have sent a message, do not come here, and please explain this to others. Spread spiritual knowledge and spiritual messages throughout the world. Spread the message of world peace to all. Seek a righteous path and wisdom will be yours." "Salutations to all spiritual seekers, saints, religions and all organizations. After I was commanded by the spirit to save and uplift humankind and the creatures of the world, I have abided by the promise to save the ephemeral world from the ocean of emotions and to free the world from the worldly sins. I have been contemplating single-mindedly (Dhyana) to free humankind and all living creatures. All sentient beings want to get freed from worldly sorrows and pains. But by birth, they are not equipped as humankind to seek after spirituality and get freed. They are also praying to God (the source/spirit). They are happy to be in this world. Humankind are creating traditions that will destroy the entire humanity and living creatures. In the name of religion, killings, violence, anger, jealousy and divisions are being promoted. There is only one source; the spirit has one form; the souls of all humans are the same, only the tradition and customs are different. Always embrace the path of mercy, compassion, non-violence, peace; this is the message I want to convey to our society and to all the citizens of the world. True spirituality, the true human spirit, will always search for truth. The search for truth is the only beneficial way of humans. Despite the existence of thousands of paths, chaos, greed, attachment, anger and jealousy have imprisoned our society and humankind. In this way the world is heading towards destruction. So, it is high time that the citizens of the world must think about it. Humans should never forget their ultimate spiritual duty and their society. Refrain from killings, violence, greed, jealousy, attachments and evil character. Shed the tears of mercy and compassion; show to the world the way of salvation. After we die it is extremely difficult to get back a human life. Everyone thinks that we don't reincarnate after death. No, we receive a human life due to our virtuous work. We earn the fruits due to the merits of our work. Now the world is governed by three forms. The first form is greed; the second form is anger; third form is attachment and jealousy that are ruling this world. May all the religious traditions change. All the religious people need to first find the Truth, and by cultivating mercy, compassion, non-violence, and peace in their hearts, they need to beautify the world with the way of salvation. I will continue to contemplate and meditate for the salvation of living beings by being focused in my path of wisdom until I find the ultimate form of enlightenment, the Samyak Sambodhi. Salute to the ultimate form of enlightenment and may peace be with everyone." Thank you rimpoche, for what you are doing for the earth and all of her creatures. I appreciate and respect you. Thank you again.